This issue of Otolaryngologic Clinics, guest edited by Drs. 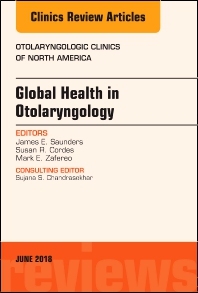 James E. Saunders, Susan R. Cordes and Mark E. Zafereo, is devoted to Global Health in Otolaryngology. Articles in this outstanding issue include: Surgical Care and Otolaryngology in Global Health; Otolaryngology and the Global Burden of Disease; Health Organization and Otolaryngology; Otolaryngology in Low-Resource Settings: Practical and Ethical Considerations; Using Technology in Global Otolaryngology; Educational Resources for Global Health in Otolaryngology; Global Hearing Loss Prevention and Services; Management of Chronic Ear Disease and Otosclerosis; An Evidenced-Based Practical Approach to Pediatric Otolaryngology in the Developing World; Outcome of Head Neck Squamous Cell Cancers in Low Resource Settings: Challenges and Opportunities; Thyroid Disease Around the World; Workforce Considerations, Training and Diseases in Africa; Workforce Considerations, Training and Diseases in Latin America; Workforce Considerations, Training and Diseases in Asia/Pacific; Workforce Considerations, Training and Diseases in the Middle East; Workforce Considerations, Training and Diseases in Europe; and Overview of Otolaryngology-related Disorders in Underserved Populations, Otolaryngology Training, and Workforce Considerations in North America.